Listen, we love Richmond's food and drink scene just as much as the next person. But if you're a swipe-app-carrying member of the singles club, you can only go on so many first dates before the idea of staring across the table at another stranger while you chew slightly overpriced appetizers makes you go a little cross-eyed. Unless you and your Bumble match hit it off instantly and just can't get enough of each other from that first handshake — no wait, should we hug? — there's bound to be an awkward moment or two, a lull in conversation, an uncomfortable glance around the bar as you desperately search for the next conversation topic. 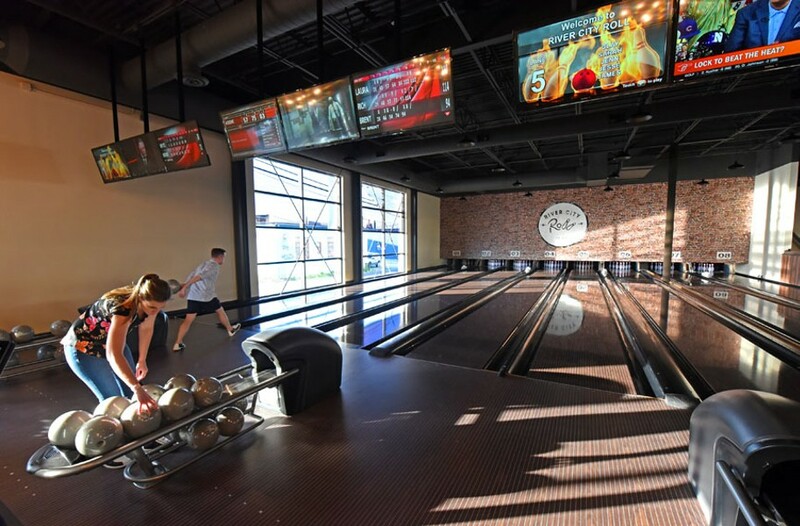 Enter River City Roll, the boutique bowling alley that made its debut in Scott's Addition in April. Engaging in an activity relieves some of the pressure to be a witty conversationalist, and if nothing else, you can talk and laugh about how embarrassing that gutter ball was. There's even shuffleboard and skee-ball to keep you entertained while you wait for a lane, not to mention a full bar and a dinner menu. Twenty lanes are available for bowling, each equipped with oversized leather couches for lounging between rounds, plus TVs with individual controls. Servers meander from lane to lane, taking bar and kitchen orders and even swiping cards right there on the spot. An hour of bowling costs $25, and everything on the menu is less than $15, so splitting the check (c'mon, it's 2018) shouldn't be too painful for either of you. As for the food? The menu includes a selection of flatbreads and pizzas, plus shareable small plates like truffle fries and carrot hummus. And hey, regardless of what you order, if you do go in for a round of bowling, you'll both be up and moving around so much that you won't have to stare at each other while you chew.